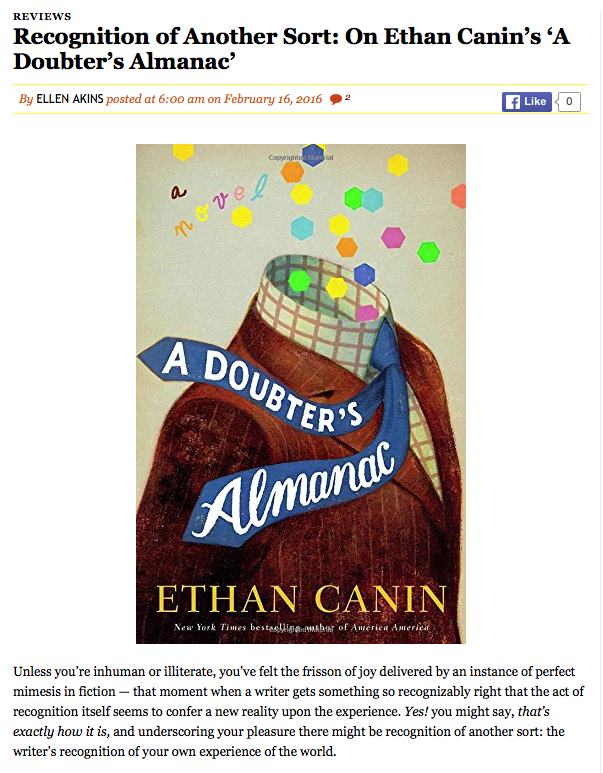 A Doubter’s Almanac by Ethan Canin (who’s very good, and, as Elaine May, doing her nagging mother routine, would say, that man is a DOCTOR), which I reviewed for the Minneapolis Star Tribune prompted a few further thoughts about what privileged knowledge means in a novel in these days of instantly & universally available information–and what we want from novels anyway–which I said a little about in a piece for The Millions. And here’s a good review from the Washington Post’s indefatigible and ever-charming Ron Charles (“even victims of Algebra II will follow his calculations of the heart with rapt comprehension”). This entry was posted in All, Blog, Reviews and tagged A Doubter's Almanac, Ethan Canin, Minneapolis Star Tribune, Ron Charles, The Millions, Washington Post. Bookmark the permalink.